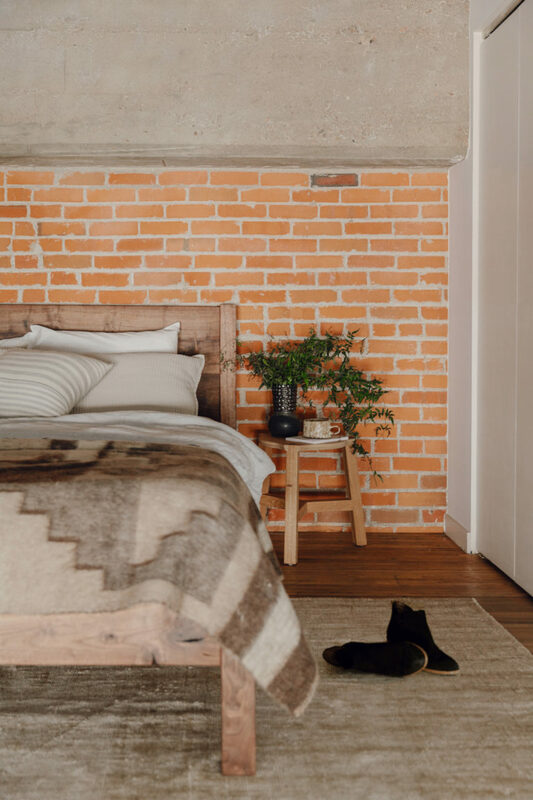 I’ve never lived in a loft before, but if I had I would have loved the cozy feel of this bedroom. Sure the ceiling is a bit low, but since the room is open to the rest of the space it actually makes it more comfortable — and I can totally picture myself snuggling here under that incredible alpaca blanket. 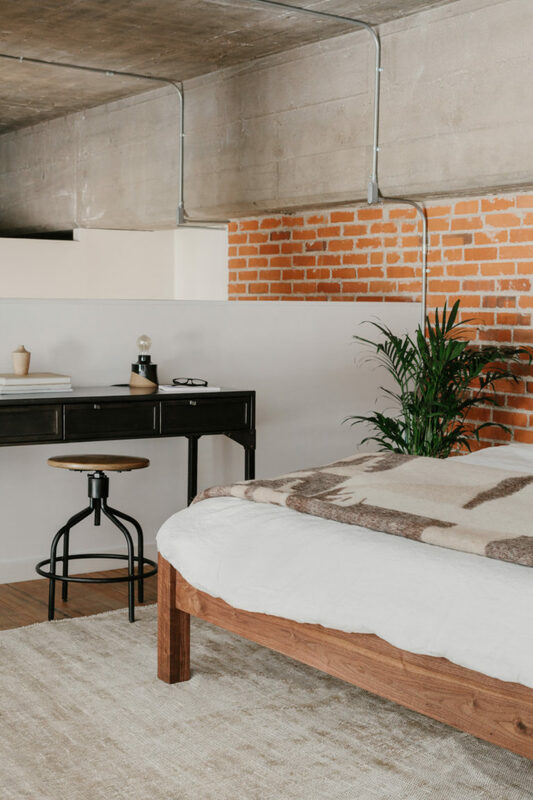 As you saw the other day (check out the first reveal of this industrial loft here) I recently partnered with Guest House to create this shoppable pop-up home in downtown Denver. 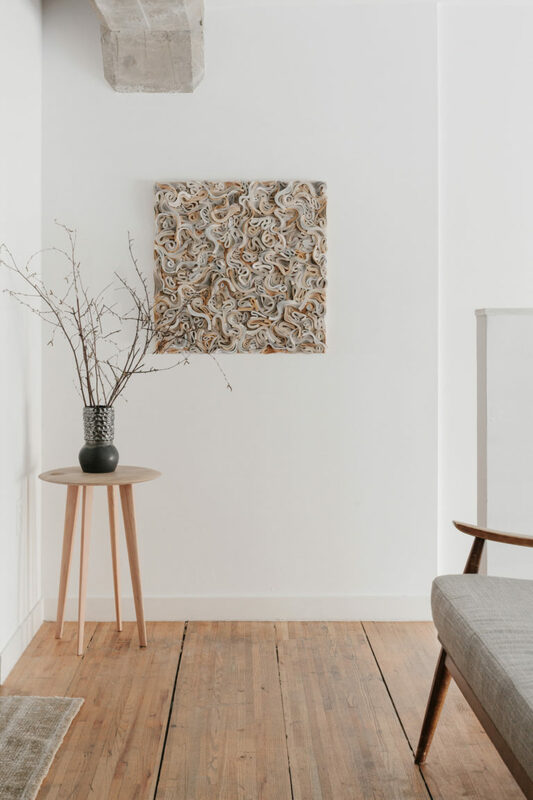 Guest House takes every-day spaces – real estate listings, restaurants, airbnbs, etc. — and transforms them into beautiful ones using as much locally-made furniture, art, and home-goods as possible. And when we can’t find what we need locally, we choose only the best small-biz brands to work with in order to make a shopping experience you can feel really, really good about! Plus, everything in this space is in our online shop so you can still support these incredible makers, wherever you happen to live. 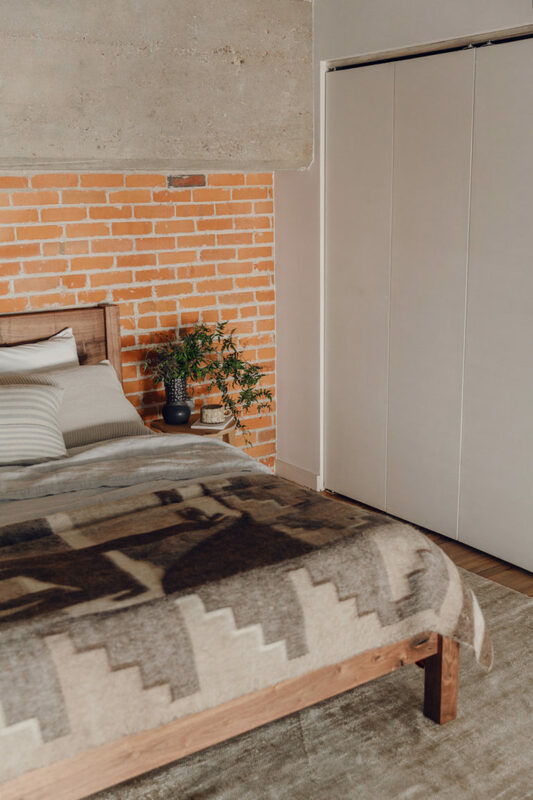 We had just two weeks to pull all the rooms together, but as soon as I saw the bedroom I knew I wanted to keep the decor on the simpler side to let the room’s architecture shine. Not only is the back wall the original 1920s brick (this building was a Cadillac service garage), the floors were taken from Pullman cars and the wall opposite the bed is actually an open railing that looks over the living room to those gorgeous windows below. I mean, that’s a stop-you-in-your-tracks kind of bed! Nick has a true attention to detail, and the more you look at this bed the more subtle, interesting design features you discover. He also happens to be the nicest guy on the planet – I interviewed him a few years ago and loved getting to know his story better (he studied woodworking in Vermont! That’s like my hometown backyard, guys). Of course such a beautiful bed needed beautiful bedding, too. 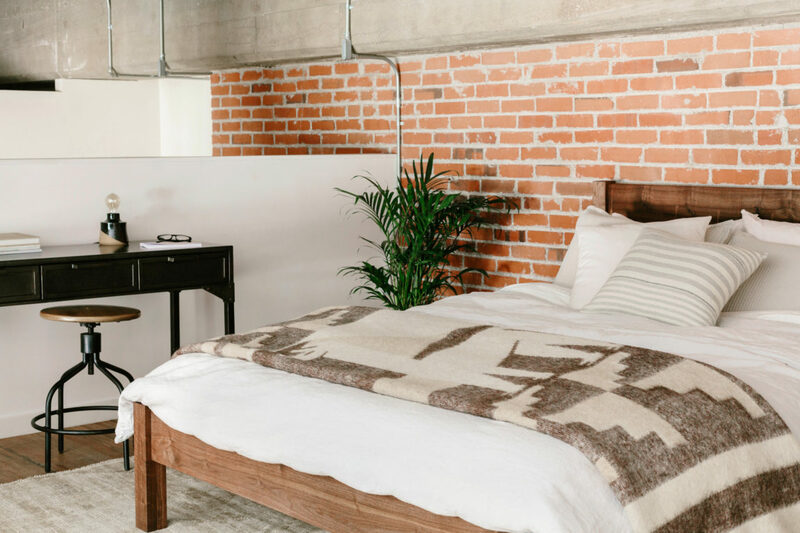 We partnered with Parachute to use a combination of their percale, linen, and matelasse collections to add texture and depth and then draped this oh-so-soft vintage alpaca blanket over the end for extra coziness. Just as important as what goes on the bed is what’s inside, though! 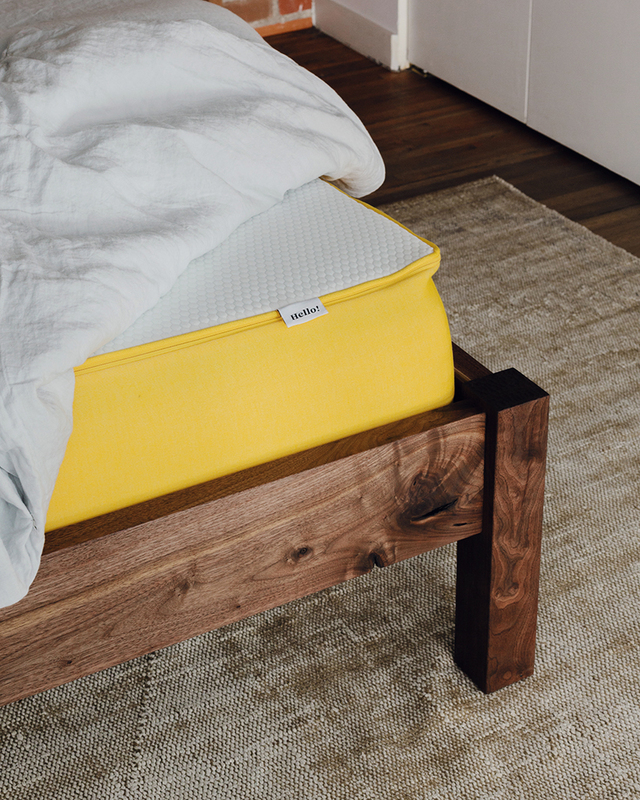 That’s why we used an Eve mattress, which is pretty much the definition of comfy. As we were styling this shoot, I literally exclaimed out loud when I knelt on it to arrange the pillows — I was totally expecting something firm and Ikea-like but I sunk right in. (Brandon, our photographer, probably thought I was crazy.) As someone who hates extra firm mattresses, I can tell you this baby was a dream. Plus, they have a 100-day free trial, free shipping, and free returns…so it’s kind of like, why wouldn’t you try it? Check out that graaaaaiiiiiin man. The shot above is also a really great detail of that vintage Oushak rug. I love this one because it doesn’t have a pattern, so the weave really stands out. The way it’s worn over the years has turned it into a much more authentic version of those “shimmer” rugs I keep seeing from bigger home stores. I think it could work in almost any kind of space, but I’d love to see it in a dining room with a lighter wood table and some dark chairs! So, so pretty. The surprising thing about this bedroom is that it’s pretty large, so the key to making it cozy was to add in a bit more furniture. To the left of the bed we placed the Lowell desk and a stool by Sixpenny (use code GUESTHOUSE18 for 10% off). 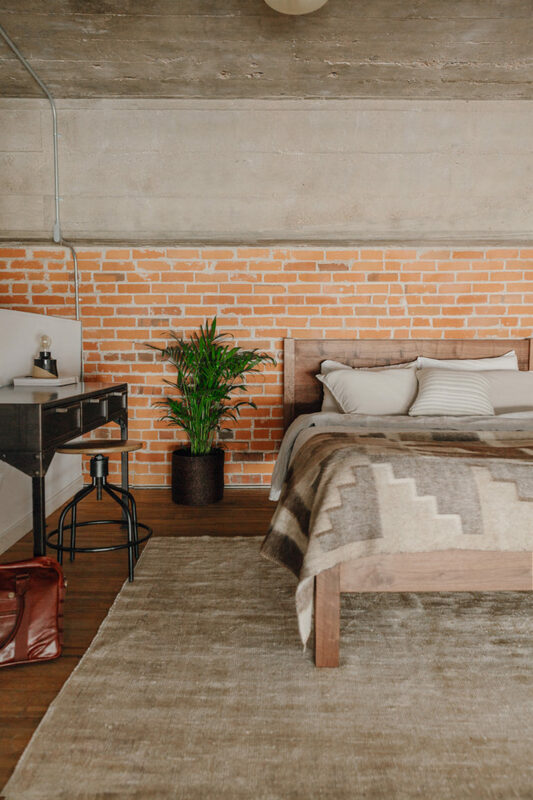 The rolled steel balances out the softness of the bedding and rug and really brings that “oh hey, I’m an industrial loft” vibe back in to the space. And how cute is that little turned wood vase? It’s made by my favorite jewelry maker here in Denver! I want, like, ten of them. This piece stops me in my tracks every time. It’s actually made from old novels! I want to take a nap here, STAT. 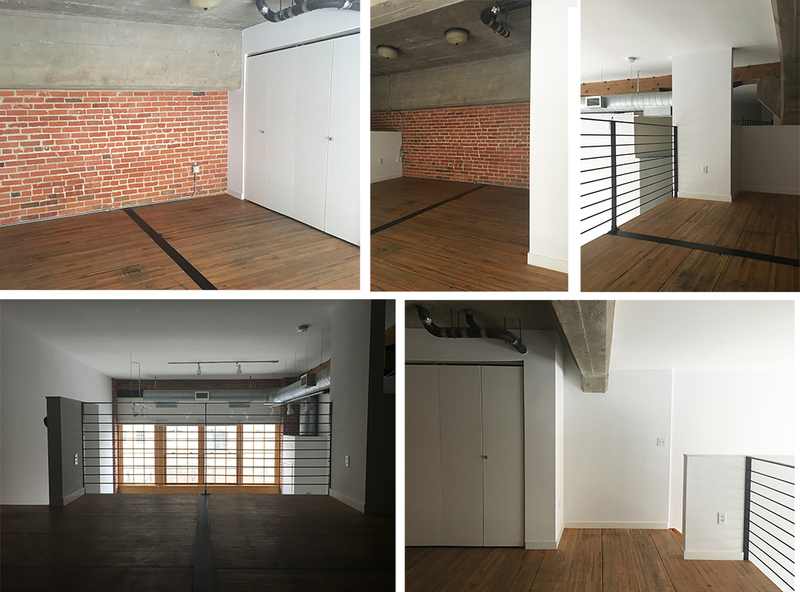 Could I live in a loft? Could you? Would the openness drive you crazy or would you love it? 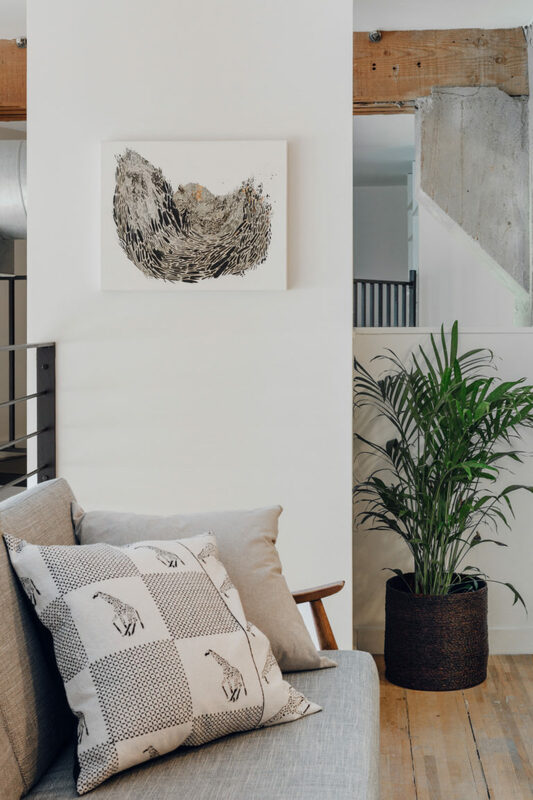 Stay tuned for the final reveal of this industrial loft later this week, and follow @guesthouseshop for open hours and info on how to shop the space in person!